Watching The Circus is a lot like attending a circus performance: Entertainment can be had in many forms, and their variety is the show’s greatest strength. After City Lights (1931), it is The Circus that best balances Chaplin’s artistic aims for the modern viewer. The film is very funny and very sad, with a complex plot by silent standards. For unity, The Circus relies upon a potent symbol, the circle, which appears both literally and metaphorically throughout its 70-minute running time. As a ring, the circle is both a place of performance and a symbol of matrimony. It also stands for ‘cyclical,’ which, in the case of The Circus, means repetition of circumstances, and ultimately, the entrenchment of social roles. 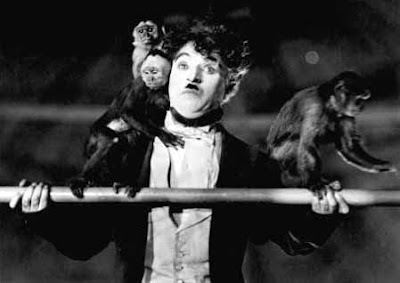 The film's main characters: the Tramp (Chaplin) and Merna, a circus acrobat and the Ringmaster’s stepdaughter (Merna Kennedy), are both given the chance to escape their circumstances and achieve happiness. Only one will manage it. The Circus’ opening shot frames a paper-covered hoop, with a star design in the middle. Merna bursts through it and we can now see the circus tent through its tears. Merna is on horseback, practicing her routine. Upon completing it, she’s berated by the Ringmaster (Al Ernest Garcia) for performing poorly. He throws her through another paper hoop, sitting on the ground beside them. She lies there, defeated, for the remainder of the scene. This image, one of the cruellest I’ve seen in a silent movie, accomplishes several things. First, it ensures our sympathy will never rest with the Ringmaster, even though he runs a circus that loses money and appears to be a widower. Second, it establishes Merna as a sympathetic character, but one who is unable to stand up for herself or otherwise improve her position without help. Finally, it enforces the circle as an image of hopelessness—by throwing Merna through it head-first, the Ringmaster illustrates their cycle of violence. Now the Tramp is introduced. He first appears in a crowd outside a funhouse, near the circus tent. The facade of the funhouse resembles a giant cuckoo-clock, with several large automata built into it, Thorough a series of complicated events, the Tramp is mistaken for a pickpocket, flees the police by hiding in the funhouse’s hall of mirrors, and finally, poses as an automaton to evade capture. 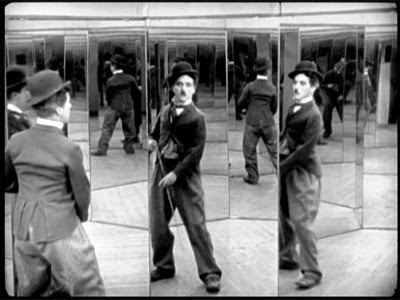 All three gags are part of one chase sequence, each forces the Tramp to pose as something he is not, and each involves repetitive behaviour. The chase goes on; Chaplin’s character is driven into the big top itself, where he crashes the main-event performance and generates far more laughs than anyone performing on purpose. The Ringmaster eventually hires him, but only as a property man (labourer) and part-time performer. The Tramp is unaware of how big a star he is, so he’s easily low-balled. As expected, the Tramp falls for Merna, who's as pretty as she is vulnerable. What Merna feels in return is less clear. She’s responsive to the Tramp's charms, though not in an obviously romantic way. We can believe her feelings are developing in that direction, at least for a while. However, what we do know is that Merna loves the Tramp as her benefactor. His first good deed in the film is to share his breakfast with Merna; in addition to beating her, the Ringmaster also denied her food. She’s starving, so the Tramp splits his only egg. Merna returns the favour a little later, by telling the Tramp that indeed, he’s the star of the show. The Ringmaster overhears this, breaks up their conversation and attacks Merna again. And now the Tramp protects her once more, telling the Ringmaster that if he lays a hand on her, he’ll quit the show. Oh, and he wants to be paid what he’s worth. In both of these episodes, the Tramp helps someone who ought to be helping him. He has no job, but gives her food; he is poor and powerless, but employs brinkmanship both to save her body and advance his position. The Tramp, it seems, is on the rise. Soon, our hero is making big money as a performer. His act mostly recreates, night after night, the chaos he originally caused when he was chased into the big top months before. We’re cheering him on, of course. We watch him, with confident (though not arrogant) airs about him, preparing for a show. On the other side of the tent flap, Merna and some of her girlfriends are seated with a fortune teller. The fortune teller predicts that Merna will marry a “dark, handsome man who is near you now”; overhearing this, the well-placed Tramp decides it must be him. He immediately buys a ring from one of the clowns—for five dollars—and prepares to propose. Chaplin doesn’t let us bask in this for long. The next scene introduces Rex (Harry Crocker), the handsome new tightrope walker, and Merna is instantly lost to him. She tells a friend that she’s in love, and the Tramp overhears this too. His joy is obliterated. To Chaplin’s credit, though, Rex isn’t played as a jerk. The Tramp doesn’t like him, but how could he? Rex captures Merna’s heart just by showing up, truly putting the Tramp in his place—fame and wealth be damned. The Tramp also takes Rex’s place, at least once. When Rex disappears before a performance, the panicking Ringmaster orders the Tramp to do his tightrope act. The ensuing scene is classic Chaplin, mixing high and low comedy in equal measure. The Tramp is almost killed, of course; after a succession of near falls, he completes the act and speeds out of the big top on a runaway bicycle. The Ringmaster, angered by this, again vents his frustrations on Merna. The Tramp then re-emerges and beats the Ringmaster with his fists. He saves Merna, but is fired. One more time, the Tramp has been forced to adopt another’s role. When Rex is absent, he replicates his performance; when Rex’s girlfriend is threatened, the Tramp, a much smaller man, defends her in a manner Rex could have done more easily. We see his reward in the next scene, when he is sitting alone by a campfire, probably a few miles from the circus. Merna appears; she tells him she’s run away, and asks the Tramp to take her with him. This should be victory. Merna, the woman he loves, wants to be with him, even when he has nothing. The man she supposedly loves has been left behind. Yet the Tramp’s next move is not a joyful one. He asks Merna to wait at the campsite, then returns to the circus and finds Rex. He gives Rex the engagement ring, telling him, “I can do nothing for her.” Rex and Merna are married the next day, with the Tramp throwing rice over their heads. The Tramp concludes that he’ll always be a tramp. This isn’t an upbeat way to end The Circus, but Chaplin does give us a little more. In the closing scene, the three performers return to the circus and Merna demands that the Ringmaster restore the Tramp’s job, which he does. Merna invites the Tramp to ride with her and Rex to the next town. He declines, saying he’ll be satisfied with the ‘end wagon.’ As the wagon train pulls away, he stands still, and finally alone, in an earthen circle—the impression left behind by the big top. The Tramp is back where he began. He sits down, depressed, then notices a scrap of paper on the ground: It bears the same design as the paper hoop in the opening scene. The Tramp rolls the paper into a ball, stands, and kicks it behind him. He may have nothing, but it’s all his. The Circus has such interesting images that I didn’t have room to describe its slapstick comedy scenes, which are multiple and brilliant. If you’re in the mood for a funny film, don’t let this review dissuade you from The Circus. French distributor MK2 owns the rights to most of Charlie Chaplin’s later works, distributed in North America by Warner Brothers. My copy of The Circus is among them. This version includes a second disk with substantial archival materials, deleted scenes and a documentary about The Circus’ rather troubled production. Look for it here. Outstanding! I stumpled over into your site this morning exploring Silent Sites. I became enamored with silents as a child through the old Ernie Kovacs TV Show "Silents Please". I am a huge "Chaplin" Fan, even if he was considered "Politically Incorrect" for the time. Technology truthfully has advanced. We have Digital this and that, but the "Silents" were and still are an enduring artform. Please keep up the good work! Thanks for the feedback, Clifton. If you like Chaplin, you'll enjoy my June 7th entry, too. The last scene, with him on the crate in the middle of the circle, was one of the most beautiful I've ever seen. THE CIRCUS is usally skipped over as writers jump from THE GOLD RUSH (1925)to CITY LIGHTS. This is a shame for THE CIRCUS is an absolute "Gem" in every way. It is interesting to compare Buster Keaton's THE CAMERAMAN; Harold Lloyd's THE KID BROTHER and Chaplin's THE CIRCUS. All three films include very funny material involving monkies. Each is a classic and each shows how the three greatest silent comedians used animals in a different way.